Over a decade ago, Destiny’s Child put out a call for “all the women who are independent” to “throw their hands up at me”. The irony that this track, Independent Women (Part 1), was prominent on the soundtrack of the first Charlie’s Angels film - basically a story of three strong, feisty women… who have all their movements controlled by a man named Charlie - appeared to be lost on Beyoncé and co. Over the next ten years, the concept of feminism and free-thinking women hardly thrived in popular music, as the stronghold of commercial hip-hop - much of which is preoccupied with the acquisition material goods and misogyny - grew and grew. In fact, even Beyoncé herself seemed to give up: in 2001 she was a survivor who “ain’t gonna give up”, but just four years later, Destiny’s Child wanted to Cater 2 U and by 2008, well, “if you like it then you should’ve put a ring on it”. Obviously the fact that contemporary R&B hasn’t had a female star intent on doing things on her own terms since Lauryn Hill went AWOL isn’t expressly Beyoncé’s fault, but the world needs a saviour. If the music press is to be believed, our heroine has arrived in the shape of Janelle Monáe: a 5ft waif with extravagantly coiffeured hair and a penchant for afrofuturism (well, haven’t we all?). On the evidence of Monáe’s début full-length LP, The ArchAndroid, she isn’t just here to save music, she wants to take us on a ride through history too. In short, the sheer breadth of styles on display during The ArchAndroid is simply astonishing. Sure, it comfortably clocks in at over an hour, but it still dabbles with hip-hop, jazz, swing, pop, salsa and rockabilly with consummate panache in that time. Almost as if to prove she isn’t your ordinary, interchangeable R&B poppet, The ArchAndroid begins with Suite II Overture - a neo-classical orchestral piece with robotic voices, which evokes Disney’s Fantasia if it were rewritten in the year 2100. The future is a theme which runs throughout The ArchAndroid, but the influence of so many of soul and hip-hop’s biggest names means that this album could conceivably be from any year between 1985 and 2020. Faster is an exhilarating mix of hip-hop and 1920s swing, Say You’ll Go is a ballad with African percussion which seamlessly morphs into a piano piece created to showcase Monáe’s stunning voice, and Make the Bus is high campery - like an R&B Gaga - featuring Of Montreal. A concept album The ArchAndroid may be, but that doesn’t mean there aren’t stand-out individual tracks. Locked Inside is the 21st Century cousin of Michael Jackson’s Rock With You and could comfortably fit on Off The Wall (yes, it’s that good). The frantic, sprinting beats of OutKast’s B.O.B. are imitated on the genuinely thrilling Cold War and if you thought that was good, the following track is surely the best song of 2010 so far: Tightrope. You’ll have no doubt heard Tightrope by now, and probably seen the video with an androgynous Monáe fully suited-up, replete with bowtie, and shimmying as if the floor were slathered with grease. Tightrope may be well-known, but that doesn’t diminish its potency: Monáe confidently throwing out urgent syllables, funky brass stabs, rousing vocals and a typically expert guest verse from Big Boi. The story goes that Monáe was discovered by OutKast - she appears on their 2006 soundtrack album, Idlewild, and also crops up on current Big Boi long-player, Sir Lucious Left Foot: The Son of Chico Dusty - so comparisons are inevitable. However, Monáe could well be the female counterpart to the Atlanta duo, with that comfort and ease with which she inhabits a range of genres, and etherealness that suggests she’s been beamed in from another planet. She may well have borrowed the torch OutKast inherited from Funkadelic and Prince, and she’s certainly a worthy guardian. For a first album, The ArchAndroid is astoundingly accomplished. It would be a lie to say there aren’t a few lulls in the back end of the record as Monáe begins to take fewer risks, but only the truly seminal albums can keep the quality level so high for over an hour. However, just as you’re lured into thinking the album’s petering out, it closes with BaBopByeYa: a sprawling, nine-minute odyssey encapsulating everything great about this record. Equal parts smoky club jazz, salsa and rousing Bond theme, BeBopByeYa is a bombastic display of intent that shows the clear talent Monáe has her disposal and makes you feel safe betting that she’ll be far more than a one-album wonder. 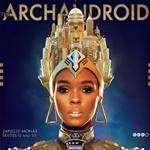 Sometimes when albums garner seemingly endless praise - especially first efforts - it’s tempting to see it as little more than hyperbole, but with The ArchAndroid, Janelle Monáe has displayed that the excitement is entirely justified.